Advent Calendars, Countdown to Christmas Calendars, Multi-Day Giveaway Calendars — whatever you call them, they are a much-loved marketing tool during the holidays. Customers enjoy them because they offer many chances to win and each day is a surprise; marketers love them because they encourage people to return to the campaign day after day, facilitating customer engagement. It might seem a little late to get started on this type of campaign, but you don’t need to run it for the entire month. Try just one week or 12 days before Christmas. Alternatively, run a 12 Day of Christmas campaign, where the first day of entry starts on Christmas Day and ends on January 5th. Below are three impressive campaigns that were built using our Multi-Day Giveaway templates. Plus, I have two ideas for running advent calendars using hashtags on Instagram and Twitter or comments and likes on Facebook. 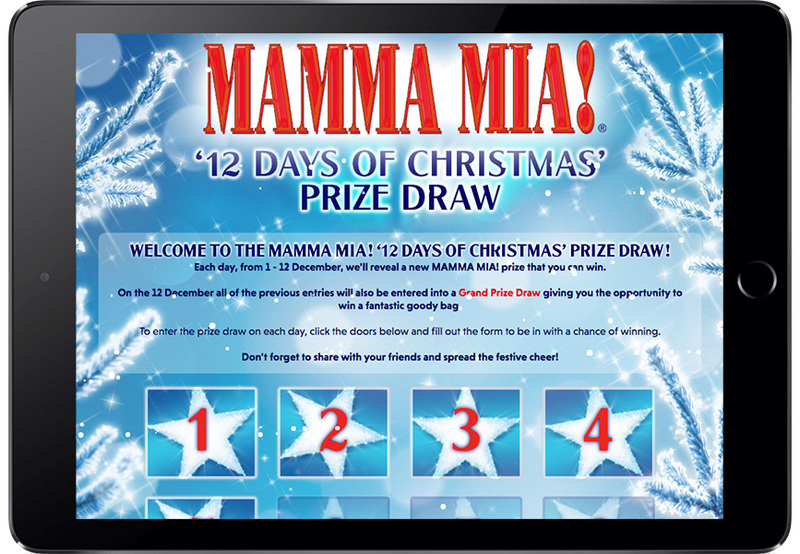 With their 12 days of Christmas prize draw, MAMMA MIA! is giving their fans around the world the chance to win MAMMA MIA! prizes — a smart idea for such a global brand! Each day, a prize is revealed, with a grand prize on day 12 consisting of a culmination of all the previous days’ prizes. Everyone who enters during the first 11 days of the campaign is automatically entered to win the grand prize. MAMMA MIA! gives folks the option to subscribe to their newsletter, building the brand’s email marketing list while encouraging customer engagement. The newsletter information they collect will come in handy when MAMMA MIA! goes on tour, as it will allow them to reach out to fans across the globe. TIP: Change the numbers on your calendar to images with hack #1 in our Holiday Calendar Hacks blog post. Are you a new company? Multi-day calendars are a perfect way to “yell from the rooftops” about your business. 23 City Blocks Catering created a campaign that does just this, while driving more traffic to their website at the same time. Each day features a culinary- or entertaining-themed prize that was hand-selected by a 23 City Blocks Catering team member. The grand prize, a two-hour happy hour at the winner’s home or business, catered by 23 City Blocks Catering, is the ultimate way to promote their business — they are giving away their own service! 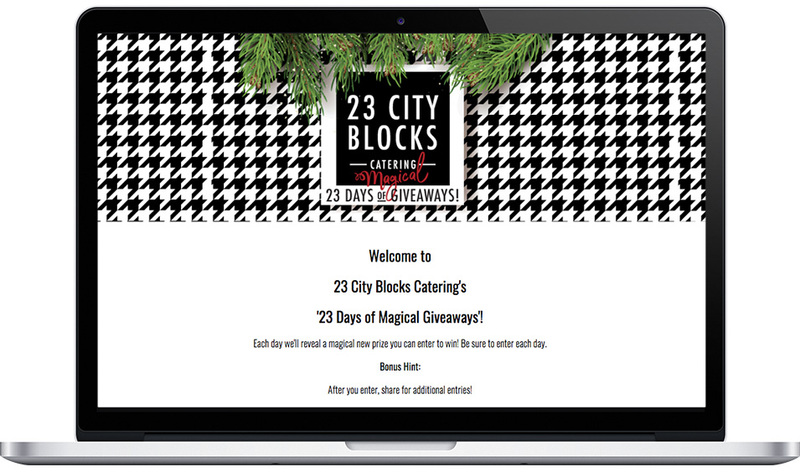 TIP: 23 City Blocks Catering sends an autoresponder to entrants after form submission to promote their business and drive traffic to their site. Use our Marketing Automation tool to set up an autoresponder for your campaign. Allanwater Homes sure got creative when setting up their multi-day giveaway calendar. 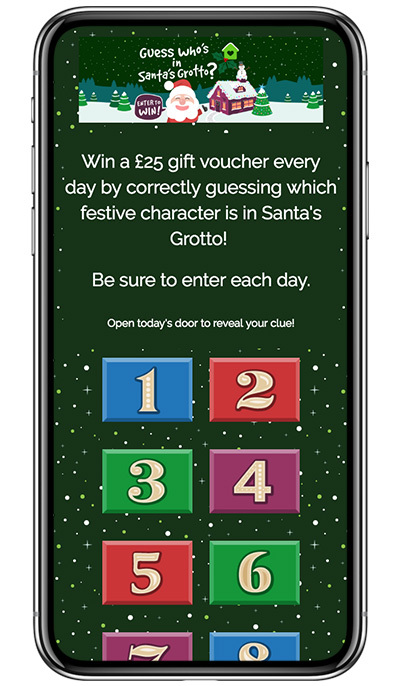 Each day, folks are asked to guess who is in Santa’s grotto. Entry popups include images of a home that Allanwater Homes is building, selling or showcasing, along with entertaining questions like, “Who does Santa know who has a red nose?” (answer: Rudolph). People who answer the daily question correctly are included in the daily drawing for a £25 voucher. This campaign is a fun way to promote Allanwater Homes’ properties to potential buyers. TIP: Our Random Entry Selector includes a Filter feature, which can help you choose a winner from the people who submit the ‘correct’ answers to your entry form questions. Don’t want to create a landing page campaign? Try hosting a daily hashtag Advent Calendar contest on Instagram or Twitter, or use Facebook posts to collect entries with comments and post Likes. Two ideas on how to run these types of contests are below. With an Hashtag contest, entries are submitted when folks post to Instagram or Twitter with the hashtag (or hashtags) you specify for your contest. Hosting an Advent Calendar contest on Instagram and Twitter works the same way! Each day, you post the day’s prize, along with the hashtag(s) to enter that day’s giveaway. Advent Calendars on Instagram and Twitter work well to collect user-generated content and facilitate repeat customer engagement with your brand. TIP: Use our Feeds feature (available on our Brand Plan) to pull in hashtag contest entries from Instagram and Twitter. A Facebook Post Advent Calendar Contest is pretty simple. Just post each day’s prize and ask people to either Like the post or comment on it to enter. Our Facebook Comment/Like Importer allows you to pull those entries into a database. TIP: Use our Random Entry Selector to choose a random winner from those entries you collected with the Facebook Comment/Like Importer. If you have any questions about setting up an online Advent Calendar or using our Multi-Day Giveaway Template, just shoot us an email: theteam@shortstacklab.com.